Buy a stool that both you and your feet will love. Nothing's quite like being able to kick your feet up and lounge in your living room with a blanket and cup of warm tea after a long day of work. Everyone knows that elevating your feet takes the stress off your back and relieves the body. This elegant foot rest provides you with the perfect blend of comfort and luxury. With its simple, handcrafted and attractively finished look, this maple stained foot stool, along with its practical uses, makes a great addition to any living room, family room, or home office as room décor. Its custom design is filled with character, and the frame is well made, sturdy, and will last you a lifetime. Your feet will rest on a comfortable handmade cushioned top. 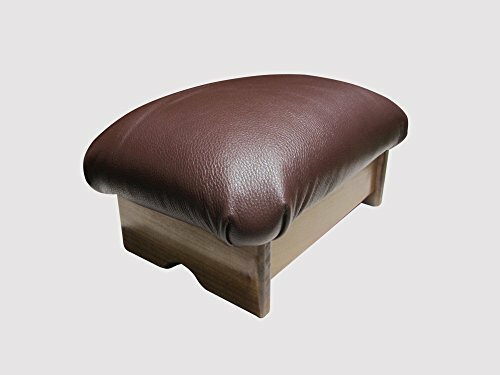 Upholstered with our popular Gaunache Chocolate Leather, this padded foot stool is also available in over 30 other high-end fabrics and patterns. Browse through our selection of fabrics and find one that compliments your living space! Each stool is individually hand-sanded, stained, and sealed in the U.S.A. Dimensions: The hardwood frame - 12'' long X 8'' wide. The cushioned top - 15'' long X 10'' wide. The stool (frame and cushioned top) is 7'' or 9" high. We highly recommend that you take these measurements into consideration and confirm that these dimensions satisfy your specific needs. If you require special modifications or have specific dimension requests for your stool please contact us. Customer success: I purchased one of your footstools from Amazon last week. From the beginning I was favorably impressed by the fine craftsmanship that went into the construction of the footstool. Now that I have been using it for a few days, I confirmed my initial reaction and find that it works well for my purposes. Thank-you for sharing your fine craftsmanship with me. If you have a specific problem that needs a design solution, contact KR Ideas and have them create a product tailored to your needs. If you have any questions about this product by KR Ideas, contact us by completing and submitting the form below. If you are looking for a specif part number, please include it with your message.